Publication: February 24th 2014 by Gossamer Publishing. Fighting to survive, Mystic Elton takes one look at the man standing in front of her and knows she needs to make a decision – does she want to live? Discovering that her boyfriend is storing enough drugs to supply a small country, she looks for an escape route. He’s standing in the doorway – standing in the way of her freedom. Mystic has nothing left – no family, no friends, no one she can rely on. She is all alone and frightened. Managing to get past her ex, she flees, running to the other side of the country, landing in Seattle, she changes her appearance, her name, her life. After a year, she begins to feel safe. Her ex won’t find her. She’s beginning to pick up the pieces of her once shattered existence and carve out a new world for herself. That is, until a tall, well-dressed man shows up at her job and tells her they need to talk – and he knows her real name. Fleeing to get away from him, she rushes to the back room and grabs her Taser. When she hits him with it, she thinks she’s home free. All Mystic has done is really tick off Bryson Winchester, and all he’s trying to do is help her by getting her scum of an ex off the streets. Mystic has a choice to make. Is this a man she can believe in? Is any man worthy of her precious trust? She’ll find the answers, though they may not be what she expects or wants – her entire world is about to be turned upside down, because not only will she find there are some men out there worth trusting – she will find out the secret of her birth – the reality of who she really is. Some things should stay in the past – and others… Other things will come back with a vengeance. I really enjoyed this book. It flowed easily, kept me engaged, and had a great story. It is a relatively short story. This book deals with some heavy issues with abuse. And I am sure some people would think that Misty was being ridiculous in figuring out her feelings for Bryson. When someone has been abused, there life is upside down and they don’t have the greatest of self esteem. Misty’s character was strong. She is a fighter and that’s what kept her alive. The one piece of omission that Bryson kept from her was minimal but to Misty it was huge. She had to figure that out on her own. Misty somehow found herself under the thumb of a self imposed bad cop boyfriend. He is an abuser and controller. Misty finds herself under his fists and in the hospital often. She is told to give stories of why she is hurt or else. When she finds his drugs by accident and he catches her, she knows her time is up. It’s either get away now or he will kill her. She escapes and after a year, she starts to breathe. But someone comes into her job place looking for her. Because her ex was a cop, she can’t trust anyone. She has a taser and uses it on the handsome FBI agent trying to help her. And if the FBI found her, then it’s only a matter of time before her scum of the earth bad cop ex-boyfriend will find her too! I loved the tasing part of the book. I have a brother, son and nephew in law enforcement and I hear lots of stories and have watched them tase each other. They just laugh it off. Showoffs! But anyway, the two (Misty and Bryson) end up on the ground and that’s where they both find their initial attractions. Bryson is one amazingly patient and kind man. He tried to fight his feelings for Misty but just gave in after awhile. His career be damned for his conflict of interest. He is good at his job. I really liked that the romance took a while and that he was patient with her. Otherwise it wouldn’t have been realistic. Misty was also abandoned as a child. She knew she had a brother somewhere, or so she hoped due to the note left with her when she was dropped off. Misty gets a huge bonus in this book because she learns that she does indeed have family. She just doesn't know if they will love and accept her. 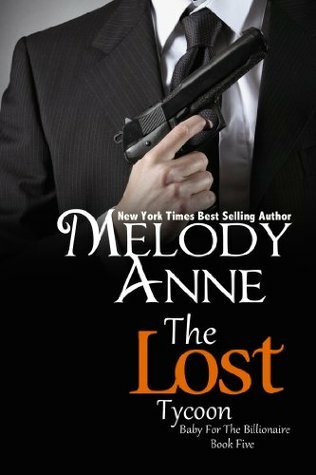 This is my first book from Melody Anne and won’t be my last! Oh, no. Oh, no. Misty looked up into the steady gray gaze of the giant of a man standing in front of her. No! She was safe. It had been a year — a full year. It was only a few months ago that she had let down her guard, had decided it was safe to live again, had gone back to her natural hair color. Jesse had moved on, surely. He wouldn’t have stayed single this long. He had to have a woman to boss around — to beat up on, by now. He would still hate her, still want her dead, but he wouldn’t still be searching for her. There was just no possible way. “I…uh…I don’t know who you’re referring to,” she stuttered, and she crept toward the door to the back room. She was working a crappy job at a fast-food joint. It was nondescript, possibly even considered a bit seedy, and they hadn’t blinked when she’d given them her false name, her poorly done fake ID. She sure as heck wouldn’t eat the food there, not with their lax views on hygiene. They hadn’t even made her get a food handlers card. But, the job was working for her for now, allowing her to save up for her next move – though she wasn’t saving much. If she could just get through the door, get to her locker, then she’d be able to grab her Taser. She’d started leaving it in her purse just a few months ago. Up until that point, she’d carried it on her, keeping the small, but hopefully effective, device in her pocket, just in reach of her shaking fingers. This was what happened when you grew lax. This would be what killed her. “I don’t need help. You have the wrong person,” she said, her voice more steady. He was watching her move toward the door, but he wasn’t taking a menacing step toward her — wasn’t reaching for the gun she knew he had to have on him. She was close, so close. Inching a bit closer to the door, she kept her eyes on his hands. Those would tell her his next move. She’d become an expert at reading Jesse through his hands. The second they clenched she had known she was in trouble. This man’s hands were sitting idly at his hips, just kind of hanging there. “Can I please sit down with you for a few minutes of your time? I won’t ask you to go anywhere alone with me.” His voice, she was sure, was supposed to convey trust. That only made her more suspicious. “Sorry. I have to get something from the back room.” She took her chances and darted through the door, not looking back as she made her way to her locker. Thankfully, it was open, since it was only her and one other kid on shift, who she actually trusted. She quickly reached into her purse. When her fingers clasped around the small Taser, she felt her fear dwindling. It wasn’t as deadly as a gun, but it would knock a large man down long enough for her to get away. He’d followed her. And he was grabbing her arm. Misty didn’t hesitate. She turned back to face him and pushed the button on her weapon. His eyes widened with shock followed by a shot of pain as thousands of volts of electricity traveled through his skin into his stomach. He released her arm, and Misty took a step, planning on getting the hell away — far away from him and this place. It was time to find a new city. She’d stayed too long, far longer than she had originally planned, but her car had died, and she hadn’t saved enough to move again yet. Almost but not quite. The heck with it now, though. She’d take a bus, and live in a shelter for a while. She wouldn’t be returned to Jesse, not ever again. When the man’s hand snaked out and grabbed her leg, tripping her, Misty gasped. She got ready to use the stun gun again, longer this time. “I don’t think so,” he growled between clenched teeth. He smacked the gun from her hand and pinned her beneath him. Melody Anne is the author of the popular series, Billionaire Bachelors, and Baby for the Billionaire. She also has a Young Adult Series out; Midnight Fire and Midnight Moon - Rise of the Dark Angel. She's been writing for years and published in 2011. She hold a bachelors degree in business, so she loves to write about strong, powerful, businessmen. I love Melody Anne, and have read many of her books. I will be adding this to my TBR list. No, this would be my first book of hers. 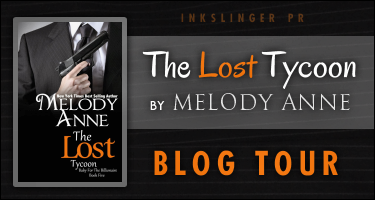 Melody Anne is a new to me author. Thanks for the intro. I haven't read any of Melody Anne's books. The Lost Tycoon book cover looks intriguing. I just love intrigue and romance. I have bot read a book by this author but I find myself wanting to know what happens next after reading the excerpt. I'll be sure to start this series!